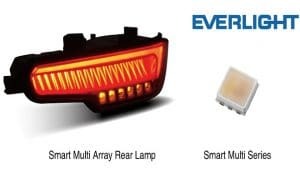 Everlight Electronics Co Ltd, a global leader in LED and optoelectronics, has introduced a latest range of products including modules such as a Mini/Smart Multi Array Rear Lamp and an ADB matrix headlamp, as well as an infrared heartbeat smartwatch at Electronica 2018. The ADB matrix intelligent LED headlamp of Everlight is incorporated with smart control that can automatically turn off the source of light in the region in order to avoid interference from the high beam when CCD sensor senses an oncoming vehicle. The LED headlamp is equipped with 24 LEDs of EVL-EL ALFS 1×1 (EU) series, where a single LED is provided with 245 lumens (lm). The combination of smart control, CCD, control module, fisheye lens and guide prism in special arrangement make the headlamp more accurate on lighting and identification. The latest products are in accordance with the ECE R112 class B Driving Beam and designed and developed jointly with all original equipment manufacturers (OEMs) involved. The latest Mini Rear Lamp was manufactured by Everlight using fine pitch display components that meet 27.63 ppi. The lamp is incorporated with an adaptive rear lamp system and is flexible in adjusting the displayed texts and figures to offer a clearer image quality. The Smart Multi Array Rear Lamp uses Smart Multi Series (3.5×3.5×0.8mm) of Everlight. The rear has a built-in drive and control integrated circuits (ICs) to achieve the delivery of information and a diversified figure display in a most suitable way. The latest mini rear lamp gives a priority solution for rear lamps due to its visual effect along with performance and quality. Everlight’s IRRG25-16C infrared LED is suitable for oximeters. The new product is an SMD transmitting component, available in three-colour wavelengths of infrared (940nm), red (660nm) and green (525nm). The IRRG25-16C, together with PD51-40 series, is suitable to retrieve the heartbeat rate in a most convenient way in smart wearables like sports watches.